Very sorry for your loss at your organization. He sounds like he was a good man. 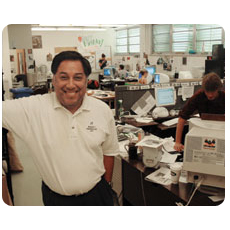 My condolences to his brother, friends, and the staff at Cal Coast News. This site has been a great contribution to this community and I hope it continues its great work in the future. Please let us know if there is anything that is needed to ensure that the goals of George Ramos are achieved and that Cal Coast continues to grow and serve the interests of the people in this community. This is just terrible, such a great man and so young, my heart and sympathy go out to Cal Coast and his brother, my condolences. I had the pleasure of working briefly on a project with George Ramos. I say briefly, because once we had everything together, we found that we needed some legal and technical advice from the experts in the field. George suggested we get on the phone, milk our contacts, and see what we could get. We did and ended up talking to the US Copyright Office and other experts around the US. We finished our part of the project in a matter of hours instead of the projected 3 months, and I got to see George in action. Great guy. He will be missed. I wish I had known Mr. Ramos. RIP. Lisa Rizzo and I will be on Dave Congalton’s KVEC radio show at 5 p.m. to talk about George. Turn your radio to 920 AM or listen live at 920kvec.com. Karen – My condolences. He was a good newspaper man, a decent field reporter and a brilliant columnist. His point of view in the public dialog will be missed. I read him early in his career with the LAT and thought him horribly biased. Later I found him measured as he grew beyond race issues. Rest in peace good servant. You have given much more than taken. I listened this afternoon, and only then did I realize the way in which you, Karen, were involved as part of this story. .It must have been a very difficult experience for you. I only knew George through the times that I had listened as you and he talked with Dave Congalton about your stories. I could tell that he was a man with extraordinary powers of discernment – going for the heart of a story, checking facts, and covering all the bases. As I learned about his life in today’s coverage (and the LA Times obituary), I wish even more that I had met him and gotten to know him. My deep condolences to you and your colleagues. George was all the things others have mentioned — tough, funny, a real character — and a whole lot more. George didn’t come back to Cal Poly by accident. I first got to know George in 1992, and he had a plan even then for his beloved Cal Poly. He saw what was lacking, and he wanted to be a part of the solution. He didn’t care who he offended or what protocol he was supposed to follow. He was a thorn in the side of administrators, especially then Cal Poly President Warren Baker. It didn’t bother George a bit to camp out in Baker’s office or tap on the door of his private residence. George’s mission meant a blessed many Cal Poly Journalism students had the opportunity to learn under a tremendous teacher and in an environment that grew closer to its potential. George made sure his beloved Cal Poly Journalism program was not allowed to disappear or remain in the declining state it had been in for a few years. The university was known for its engineers and ag, but George made sure we journalism kids got our share of quality education, too. George and a handful of other amazing journalism icons — Jim Hayes, Herb Kamm, and Marv Sosna — made Cal Poly journalism a wonderful place to learn the craft he loved. I didn’t actually attend any of George’s classes. That’s not to say I didn’t learn from him. He didn’t teach at Cal Poly during my time there, but he made the trip to SLO as often as possible to check in on us and offer advice. He met us in the newsroom, in the classroom, and at the bar. He would say, “I want to know what’s really going on.” He listened to us. He took us seriously. He cared. While I mourn for the loss of George as a teacher to future journalists, I remember him most for his friendship. Those meetings at the bar(s) where I saw him swill his fair share of beer and tequila created some really funny memories, especially the time we went to Jacalito — a dive bar in Lamont, CA. George was there for my wedding and made a point to see both of my older children shortly after their births. We had not seen each other as much lately, but George was family. His loss has carved a whole in my heart. I miss him already…. Thank you for sharing this…what a nice tribute!